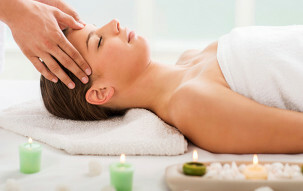 Indian Head Massage is a simple, safe and highly beneficial therapy which has been popular for over a thousand years. It is a wonderfully relaxing therapy which is based on the ancient Ayurvedic healing system and Chakra balancing. The massage is safe and very effective, without the need to undress. sometimes oils are used. The therapist uses a range of different massage pressures and rhythms to stimulate the head, neck, and upper back and shoulder area. Massage of the scalp, face, neck, and shoulders soothes, comforts and rebalances to produce a feeling of peace and tranquility. Often tension in the upper back, neck, and head can lead to migraines, headaches and back pain which can make for uncomfortable living on a day to day basis and sometimes even lead to depression. Fibrous adhesions (knots and nodules) can be broken down. Improved circulation of blood and increased oxygen uptake.